Sony has today added the NEX-F3 and Alpha 37 to its stable of entry-level changeable lens cameras, but will not say whether it still makes DSLRs. Both the NEX-F3 and Alpha 37 house a 16.1-million-pixel APS-C size sensor and are expected to cost the same price in the UK, around £530 with a standard 18-55mm kit lens. Claimed to deliver ‘DSLR-quality’ images, the NEX-F3 is a compact system camera that will replace the current NEX-C3. It features a 3in, 921,000-dot, LCD screen. Tiltable up to 180 degrees, the monitor can be swivelled around to enable the user to frame a self-portrait. This mode can also be used to shoot video, if the photographer wants to be featured in the movie, for example. Operable only in auto mode, the camera automatically detects that the user is about to take a self-portrait and fires the shutter release three seconds later, said Joe Asai, Sony UK product manager for Alpha and NEX. The new Exmor APS HD CMOS sensor has been designed to match the new Bionz image processor, according Asai in an interview with AP and WDC magazines. The F3 is designed to shoot movies at up to 1080i. Maximum equivalent ISO sensitivity is now possible up to ISO 16,000 (minimum 200), compared to 12,800 on the C3. Improvements also include a built-in flash (guide number 6) and a claimed increase in battery life to 470 shots. It also boasts an accessory port for the attachment of an EVF or external microphone. The camera is expected in shops in June, in a choice of black or silver, though it will not be available as a body-only version. Also new is a revamped 18-200mm f/3.5-6.3 zoom, said to be 12% lighter than the current 18-200mm, which will continue in the range. 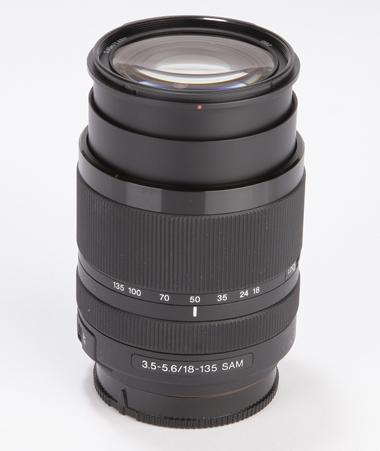 Costing £670, the new 18-200mm will be £30 cheaper than the existing version. However, it does not offer the same level of image stabilisation and its minimum close focusing distance is 50cm, compared to 30cm on the current model, said Asai. Asked if this is part of a wider plan to make Sony CSC lenses more compact, and better matched to camera bodies, Asai replied: ‘It’s quite obvious that consumers want a reasonable size and weight of lenses, which are already quite small. Meanwhile, the Alpha 37 features Sony’s Translucent Mirror Technology and will sit at the bottom of the company’s Alpha line-up, superseding the one-year-old Alpha 35. It is expected to cost around £450 body-only and be available this month. Sony says the A37 incorporates the same AF system as the A35, but engineers have tweaked the algorithms to ‘increase the accuracy of object tracking’. The A37 weighs 448g body-only and sports a 1,440,000-dot resolution EVF, offering 100% field of view and a level of detail on a par with the A57. The 2.7in, 230,000-dot resolution LCD display is tiltable, though not articulated like the F-3. The A37 features an ISO range of 100-16,000 and is due out ahead of the launch of a new 18-135mm f/3.5-5.6 telephoto, priced around £430. The camera’s top continuous burst rate is seven frames per second (5.5fps at full resolution), according to Sony. Differences over the A35 include a ‘firmer grip’. Both models include Auto Portrait Framing and 15 picture effects. Asked whether Sony fears consumers will feel confused about the launch of two similarly-priced interchangeable lens cameras, aimed at people wanting to step up from fixed lens compacts, Asai said the firm sees the two products as being aimed at different users. Asai said the A37 is targeted at the photographer who wants the use of a built-in EVF and a traditional mode dial, for example. He said Sony sees both channels as growth areas. Asked if Sony still makes DSLRs, Asai would not confirm either way: ‘We are looking at both avenues,’ he said.